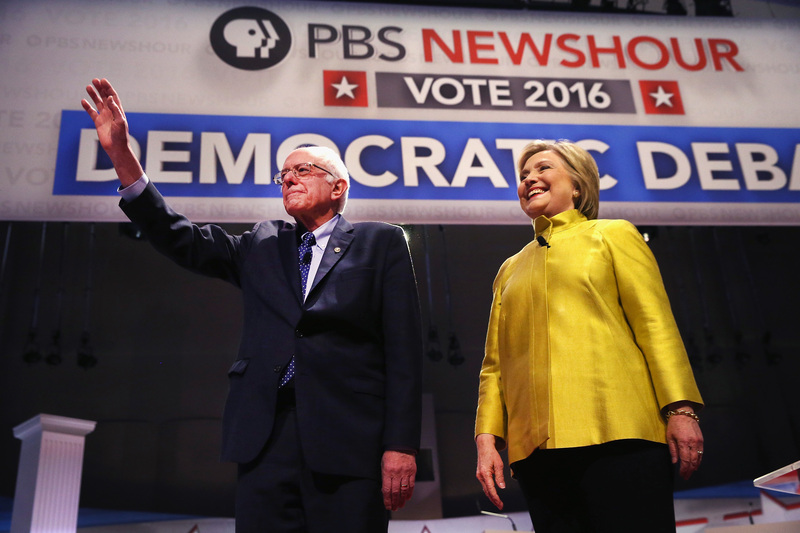 For a majority of Tuesday night, the sixth Democratic debate felt as if Bernie Sanders and Hillary Clinton were neck and neck in their war of words and that neither candidate would emerge victorious as they left the stage. Needless to say, social media took notice. Twitter Clinton and Sanders evenly split Twitter's chatter. However, that doesn't tell the whole story of what unfolded online as the presidential hopefuls faced off at the University of Wisconsin in Milwaukee. Those numbers may show a 50-50 split, but what Twitter's analytics fail to acknowledge is whether each mention painted candidates in a positive or negative light. Sanders appears to be garnering and mobilizing more young voters, who are more inclined to live-tweet a debate, especially those commonly referred to as Bernie Bros. The Vermont senators' younger, male fans have come under fire for their reportedly "vitriolic" rhetoric surrounding the Vermont senators' rival candidate, thus many of Clinton's mentions may not be all that glowing. This complicates the Twitter discussion surrounding the Democratic debate, which may be slightly more skewed towards Sanders despite what appears to be around the same amount of tweets posted mentioning each candidate. Twitter engagement has been fairly back and forth between Sanders and Clinton. Over the course of all six debates, Sanders and Clinton have somewhat vacillated when it comes to Twitter engagement. Clinton has only the slightest of edges with a cumulative average of 46 percent of tweets sent about all six debates discussing the candidate compared to 44.5 percent for Sanders. Where the Vermont senator clearly excels is in how many more Twitter followers he can gain over the course of a debate. Sanders has found surprising success when it comes to gaining followers on debate nights compared to Clinton and not just when he's taking the stage with his fellow Democratic candidate. During many a Republican debate, the Vermont senator has found himself earning more followers than the GOP presidential hopefuls facing off onstage. The numbers indeed seem impressive, save for the fact that Sanders has nearly 4 million fewer followers than Clinton. As of late Thursday evening, 1.41 million people #FeelTheBern on the social media site compared to 5.36 million people who proclaim #ImWithHer for Clinton. It’s real-time data on people, on what they’re talking about and what the memes are. They’re [voters] able to respond [to candidates] in real time. It's unclear if this topsy-turvy pattern of gaining engagement will continue or if Sanders will keep his Twitter momentum as he increases his follower count. Sanders and Clinton certainly have a whole lot to contend with before they meet again on a debate stage on Sunday, March 6. Between now and the seventh Democratic debate, the candidates will face a different kind of battle — that of the all-important Super Tuesday. Only time will tell if Clinton's follower count trumps Sanders' increase in followers as both continue to vie for the Democratic nomination.